California has the most mesothelioma deaths in the country, due to the abundant natural asbestos deposits and wide industry use. California experienced 4,295 mesothelioma deaths between 1999 and 2015. The state has a mesothelioma death rate of about 11 deaths per million each year. Mesothelioma patients or their surviving family have 1 year to file a claim. California has some state-specific laws for handling asbestos. Asbestos can be found all over California, including in the state mineral, serpentine. In fact, the United States Geological Survey (USGS) reports natural asbestos deposits can be found in 45 of California’s 58 counties. But natural asbestos isn’t the only concern for California residents. The mineral was also widely used in many industries, like shipbuilding and oil companies, within the state. Across the 45 counties in California with naturally occurring asbestos, it’s estimated there are at least 240 deposits researchers are aware of. Fresno, Lake, Siskiyou, Trinity and El Dorado counties are just a few examples of areas that have a significant amount of known natural asbestos. In addition to the dangers of exposure these mine workers faced, many other industries and job sites in California also made use of the mineral for its heat resistance and durability. California is home to many hospitals and treatment centers that are equipped to treat mesothelioma. 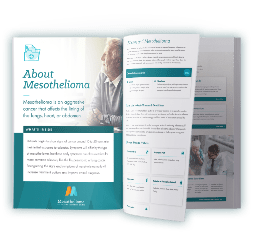 California mesothelioma patients should seek treatment with a qualified mesothelioma specialist, who will have a thorough understanding of the disease and how best to treat an individual’s case. There are a number of doctors in California at various treatment centers that have expertise in treating mesothelioma and are also involved in ongoing research to find new, effective treatments. Many cancer centers across the country offer mesothelioma treatment programs, some of which contribute to research or the development of new treatment options. California has many hospitals and medical centers throughout the state that have experience treating mesothelioma. For veterans affected by the disease (whether service-connected or otherwise), treatment may also be provided through the VA health system, like the VA Greater Los Angeles Healthcare System: West Los Angeles Medical Center. With the right treatment, it is possible to slow the spread of mesothelioma and alleviate pain. Your primary care physician or oncologist can advise the best treatment options available to you. When seeking treatment, it’s also helpful for patients to consider the financial aspects. If these treatment centers are a distance from your home, travel and lodging may become quickly growing financial burdens. Understanding your health insurance and if these mesothelioma specialists and treatment centers are in your network can help prevent unexpected medical bills. For patients who are eligible for Medicaid or Medicare coverage, the San Francisco Regional Office can provide you with details about government-sponsored treatment options in the state. In addition to finding the right doctor and treatment center for you, it’s also important to consider other services you may need during your mesothelioma journey. Whether it’s finding a support group, long-term housing options for your loved ones during treatment or transportation services to get to your appointments, California has many support organizations available. Mesothelioma patients in California often receive compensation by filing an asbestos trust fund claim or an asbestos lawsuit. In the 1980s, numerous companies facing asbestos lawsuits in California filed for bankruptcy and set up trust funds to compensate mesothelioma patients and other victims of asbestos exposure. In the past, the majority of asbestos lawsuits within California were filed in Alameda, Los Angeles, and San Francisco counties. If you have developed mesothelioma and the company responsible for exposing you to asbestos has established a trust fund, you are entitled to file a claim, regardless of how long ago you worked for them. You do not need to go to court to file a claim against one or more of these trust funds. It is also possible to file an asbestos lawsuit against the company responsible for exposing you. These cases often settle, with mesothelioma patients receiving compensation both before and during trial. An experienced California mesothelioma lawyer can help guide you through the process. Mesothelioma patients and their survivors only have one year after diagnosis or date of death to file an asbestos-related lawsuit in California, lest their claims be barred. The statute of limitations in California is not affected by your knowledge or ignorance of the defendant’s identity. This means that you have a year to file a claim even if you’re not sure who is responsible for the exposure. Contact a mesothelioma lawyer to discuss the best course of action for you and your family. Contrary to popular belief, asbestos is not entirely banned in the U.S., although its use is strictly regulated in all states. The Environmental Protection Agency’s (EPA) National Emissions Standards for Hazardous Air Pollutants (NESHAP) detail guidelines that minimize airborne asbestos fibers, which is overseen by California’s Air Resources Board (ARB) of the California Environmental Protection Agency. There are also laws in place to help protect workers from exposure. The General Industry Safety Orders chapter of the California code contains a subchapter imposing rules to protect employees against the health risks associated with asbestos in the workplace. This includes requirements about the wearing and handling of protective clothing around asbestos. For firefighters in the state, California has also adopted cancer presumption laws that allows workers’ compensation coverage for mesothelioma among other cancers. This law regulates the supply, sale, and use of “aggregate material” such as sand, crushed stone, and gravel. Barring some exceptions, the regulation makes it unlawful to use aggregate containing asbestos for any application that will remain exposed (like an unpaved road) or is at high risk of disturbance (like a gravel driveway). In areas where naturally-occurring ultramafic rock, serpentine, or asbestos is present, this law enforces mitigating measures for activities that generate dust containing asbestos, such as construction and mining. 1 Agency for Toxic Substances & Disease Registry. Asbestos Toxicity: Where Is Asbestos Found?. Published January 29, 2014. Updated August 9, 2016. 2 Agency for Toxic Substances & Disease Registry. Toxicological Profile for Asbestos. Published September, 2001. 3 California Environmental Protection Agency Air Resources Board. Final Regulation Order: Asbestos ATCM for Surfacing Applications. Updated June 3, 2015. 4 California Environmental Protection Agency Air Resources Board. Rulemaking Informal: 2002-07-29 Asbestos ATCM for Construction, Grading, Quarrying, and Surface Mining. Updated June 3, 2015. 5 California Legislative Information. California Code of Civil Procedure, Section 340.2. 6 Cancer Research UK. Mesothelioma risks and causes. Updated November 10, 2015. 7 Centers for Disease Control and Prevention. Malignant mesothelioma (all sites). Published September, 2014. Updated September 11, 2014. 10 National Cancer Institute. Asbestos Exposure and Cancer Risk Fact Sheet. Updated May 1, 2009. 11 State of California Department of Industrial Relations. California Code of Regulations, Title 8, Section 5208. 12 United States Environmental Protection Agency. Asbestos National Emissions Standard for Hazardous Air Pollutants. Updated December 19, 2016. Page last modified on July 2, 2018.